Declan Bonner and Martin McHugh appear to have ruled themselves out of contention to succeed Jim McGuinness as Donegal football boss. McHugh told the Irish Star that that he would not have the time to devote to the role while Bonner wants to remain as Donegal minor boss. ""The way inter-county football has gone, it's almost impossible for managers," said McHugh. "I just wouldn't be able to make that kind of commitment." McHugh will manage the Sligo IT college team this year and also has business commitments. 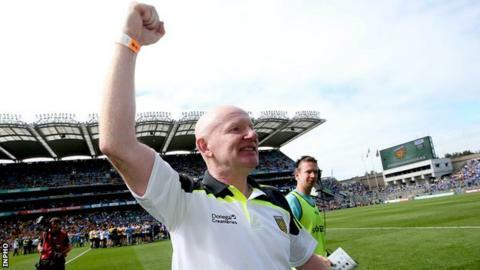 Bonner, meanwhile, told the Donegal Democrat of his desire to stay in charge of the minor team which he guided to this year's All-Ireland Final. "My priority is the minors and remaining on as minor manager and that is where my interest lies now," said Bonner. "We have invested a lot of time and effort with these players over the last few years and we want to stay with them for another year. So effectively that rules me out of the senior job." With Bonner and McHugh out of the running, McGuinness's former assistant Rory Gallagher remains the favourite for the job.